In ten years of blogging no other post even comes close to being this loved. And, good news, I’m going to be writing a lot more for and about introverts! When I did a survey here I discovered about 75% of you are introverts—much higher than the percentage in the general population. I am too (INFJ). And even if you’re not an introvert, you likely love, lead or share life with one so the content will be helpful to you too. I believe being an introvert isn’t a struggle, it’s a superpower. Let’s find your cape. Never miss a post: Click here to subscribe. I’m launching a podcast called More than Small Talk with my dear friends and fellow writers Suzanne Eller and Jennifer Watson in partnership with KLRC. The first episode is already available! You can find it on KLRC or your favorite podcast app. Click on the following links for iTunes, Stitcher, Google Play, Google Podcasts, Spotify, and TuneIn. New to podcasts? Here’s a guide for how you can listen. If you love the podcast it would be a huge gift and help more people find it if you’ll subscribe and leave a review. Thank you! 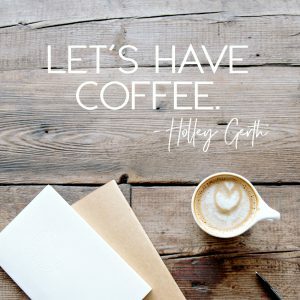 Also, I’ve passed off the Let’s Have Coffee link-up to Sue from Welcome Heart. So if you’re looking for that you can find it on her site. What are some other favorite resources of yours? What’s going on in your life right now and how can I be helpful to you here? You can let me know by leaving a comment. I’m so grateful for you and I truly believe the best is yet to be for us. Looking forward to what’s ahead! Let’s stay in touch.